CHICAGO – “Why do these bad things keep happening to these blonde girls?,” Joss Whedon. The producer/co-writer of “The Cabin in the Woods” admits that his great horror movie, recently released on Blu-ray and DVD, came about from that question which he and director Drew Goddard had explored on “Buffy the Vampire Slayer” for years. The reason I open with that is because all of you “Buffy” fans need to know how much “Cabin” is a part of that same storytelling aesthetic — the brilliant tonal highwire act between horror and comedy that no one has pulled quite like Mr. Whedon. “The Cabin in the Woods” rules in so many ways. It’s not just one of the best “horror films” of the year to date. It’s one of the best films, period. And the Blu-ray release is pretty remarkable as well. First and foremost, Goddard and Whedon are two incredibly smart guys and so their contributions to an audio commentary track are naturally going to be above average. They also contribute to picture-in-picture interviews and behind-the-scenes glimpses of production while you watch the movie. There are a number of good special features but the commentary and bonus view mode are above-good because Whedon & Goddard offer so much insight into their uniquely talented process. As for the movie itself, it’s even better on repeat viewing but check out my original theatrical review for my thoughts and don’t miss our interview with Goddard. “Cabin in the Woods” didn’t make nearly enough money in theaters and will surely find a rabidly loyal audience on Blu-ray. We need to embrace horror films this good in the hope that they won’t be so few and far between. A rambunctious group of five college friends steal away for a weekend of debauchery in an isolated country cabin, only to be attacked by horrific supernatural creatures in a night of endless terror and bloodshed. Sound familiar? Just wait. As the teens begin to exhibit standard horror movie behavior, a group of technicians in a control room are scrutinizing, and sometimes even controlling, every move the terrified kids make! With their efforts continually thwarted by the all powerful eye in the sky, do they have any chance of escape? 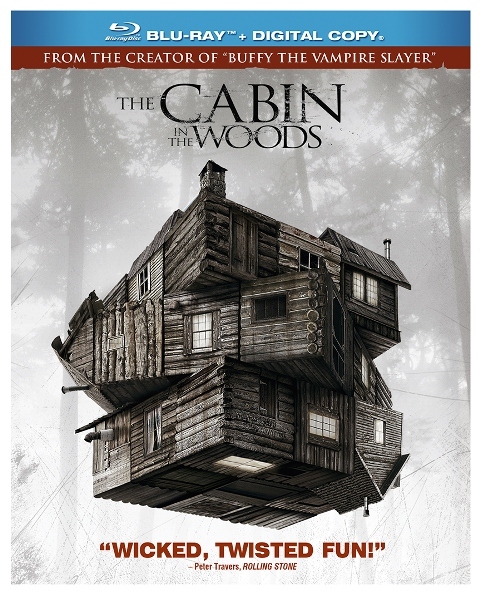 “The Cabin in the Woods” stars Kristen Connolly, Anna Hutchson, Brian White, Chris Hemsworth, Jesse Williams, Fran Kranz, Bradley Whitford, Richard Jenkins, and Amy Acker. It was written by Drew Goddard & Joss Whedon and directed by Goddard.